Will Eisner: A Spirited Life. Buy at Amazon. 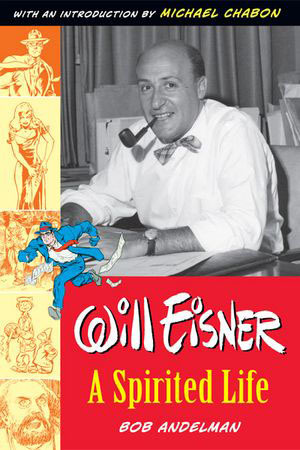 Will Eisner, A Spirited Life (2005) by Bob Andelman is the first authorized biography that explores Eisner's amazing life, detailing a career that spanned seventy years. The biography features interviews with many of Eisner's contemporaries such as Alan Moore, Dave Gibbons, Neil Gaiman, Denis Kitchen, Jim Warren, Dave Sim, Denny O'Neil and Stan Lee. The author spent almost three years interviewing Eisner, researching his life and work, and interviewing friends, family, and the creative talents the comics master inspired throughout his career. Published by M Press Books, an imprint of Dark Horse Comics, and featuring an introduction by Pulitzer Prize-winning author Michael Chabon and an appreciation by Neal Adams. Visit the Dark Horse Comics page on this book.